The staff was very courteous and friendly. The location was convenient. The bed was very comfortable. It was close to a cool brewery and had a fridge to store my TOGO options. The staff was very friendly and answered all my questions and directed me to where my room was and how to get there. The location is private and I didn’t have a problem finding a place to park my vehicle. Pillows were great, bed was awesome and the staff was great. Everything worked. Plug-ins in lamp bases made convenient access for c-paps, computers, cell phones. Nice shower. They accept dogs. Cafe on site. Great breakfast. Staff was rude and didn’t have hot water for 2 days. I had to give a $100 deposit even though I paid with my card. I thought a deposit was for only when you pay cash. My kids and i love the pool area and the breakfast is amazing. Clarion Hotel and Conference Center Greeley This rating is a reflection of how the property compares to the industry standard when it comes to price, facilities and services available. It's based on a self-evaluation by the property. Use this rating to help choose your stay! 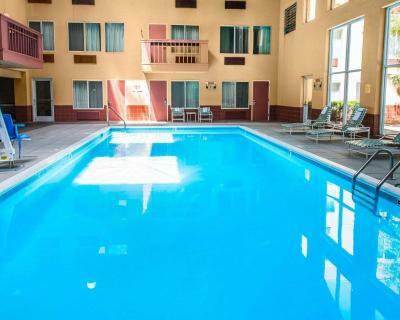 One of our top picks in Greeley.Set in Greeley, Clarion Hotel and Conference Center Greeley has an indoor pool and a bar. A continental breakfast is available daily at the accommodations. 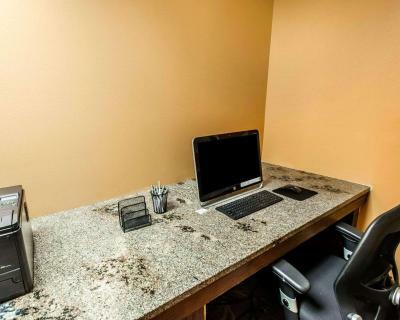 All rooms have a flat-screen TV with satellite channels and a private bathroom.There is also a coffee machine, air conditioning and a desk. 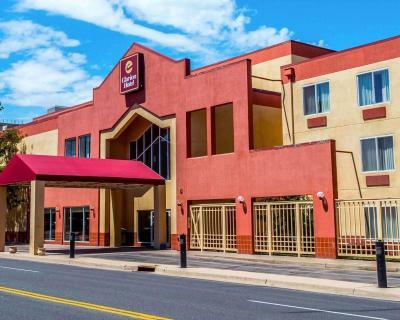 Loveland is 21 mi from Clarion Hotel and Conference Center Greeley. 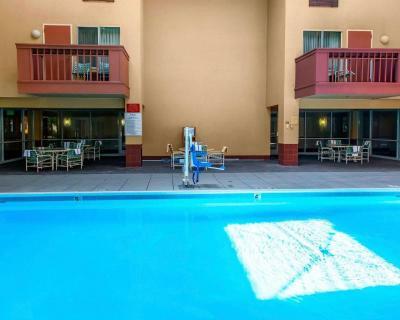 The nearest airport is Denver International Airport, 40 mi from the hotel. 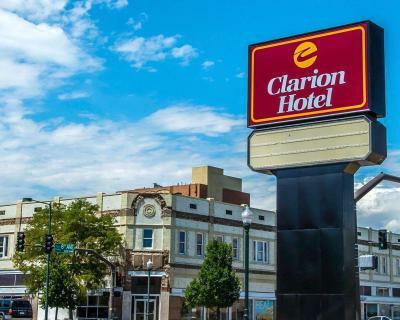 When would you like to stay at Clarion Hotel and Conference Center Greeley? This double room has a seating area, microwave and cable TV. This double room features a flat-screen TV, microwave and seating area. This double room has a microwave, cable TV and seating area. House Rules Clarion Hotel and Conference Center Greeley takes special requests – add in the next step! Clarion Hotel and Conference Center Greeley accepts these cards and reserves the right to temporarily hold an amount prior to arrival. The room felt very run down and not as clean as I would have liked. The carpet seemed dirty and the bathtub was cracked. The hallways were dirty as well. The location was OK, but right next to the railroad tracks. The breakfast was great and one of the better hotel breakfasts that I have had. There was good variety of hot food and it tasted good. There was coffee, juice and soda available which is great. Black mold. No ventalation is bathroom mold around window seals. My son and I stood at the Clarion in Greely Colorado and got bit everywhere by BED BUGS!! I'M SO MAD about this situation!! BED BUGS COME FROM FILTH HOW DISGUSTING IS THAT!! I CAN GARENTEE the house keeping at the Clarion DOES NOT wash the bedding on the beds when their guests leave because IF THEY DID this would have NEVER HAPPENED!!! Plus they advertised a hot tub and didn't even have a hot tub at this motel which was the ONLY REASON I BOOKED this motel in the first place.. I reserved a month in advance and DID NOT get the room I wanted!! So my advise to people would be DON'T STAY AT THIS DISGUSTING MOTEL UNLESS YOU DON'T MIND BED BUGS!!!! Fairly decent variety but even though we were there five minutes after it opened, the food didn't seem very hot.